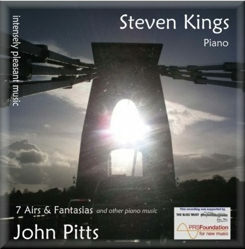 Dunelm Records released an Air and two Fantasies by John Pitts on DRD0238. Now here we have the full set of fourteen on this disc, with two extras, Changes and the Toccata, in authoritative and tremendously agile performances by Steven Kings. Pitts studied at Bristol and Manchester and in 2003 won the Philharmonia Orchestra’s Martin Musical Scholarship Fund Composition Prize. He composes for a wide range of forces, chamber, solo piano, choral included. So much for a potted biography, what about the music? Seven Airs and Fantasias was composed between 1992 and 2007. They can played in individually, in pairs or as a full set. Melodic and engaging these are delightful pieces. The first air is fulsomely melodic whilst its fantasia has a tick-tocking warmth that moves off into mellower more swinging lyricism. The second Air is Satie-drenched whilst the second Fantasie uses a prepared piano – it’s a kind of chime study with Chinoiserie elements. The third air sounds like reharmonised Chopin, affectionately sad with vestigial Rachmaninovian chording maybe. There are Francophile tints in Air 4 and minimalist dynamism animates the increasingly exciting Air 5 with its strong left hand ‘pillars’ and vaguely French deftness. Whereas there’s quite a sturdy English buoyancy to Air 5; Fantasie 5 meanwhile relates to the first, second and fourth fantasies in its exploration of tintinabulism. The sixth Fantasie is explicitly minimalist whilst the seventh air offers Pitts’s ‘twisted’ harmonies – which sounds a bit Morton Feldman-like but you should consult his website for further information on that point. The last Fantasie offers an almost obsessive chordal concentration. It ends a cycle of verve, imagination, as well as colouristic and rhythmic vivacity – and shows Pitts as honouring a wide lineage whilst absorbing it into his own schema very successfully. Changes (for twenty nifty fingers) is a fiendishly minimalistic workout for Kings and the composer, who adds his own ten digits to the pottage. It’s three minutes of pile driving energy and brilliantly exciting. The Toccata (Blue Frenzy) is longer and more malleable. It’s strong and tensile but from around the four minute mark becomes more deliberate. Outbursts though are vivid and as for its ethos, let’s just say that if Nancarrow’s player piano mated with Leo Ornstein, and Albert Ammons’s boogie-woogie piano was on an overdose of uppers it might sound a bit like this. Galvanizing stuff! I’ve also checked out the extra (review) download as well, Are You Going? for thirty nifty fingers which is based on Scarborough Fair. It’s a toccata boogie of unstoppable, unquenchable verve and you will find it on the composer’s website. Exciting stuff all round – vital, energising, but sensitive when need be. Toes – prepare to tap.